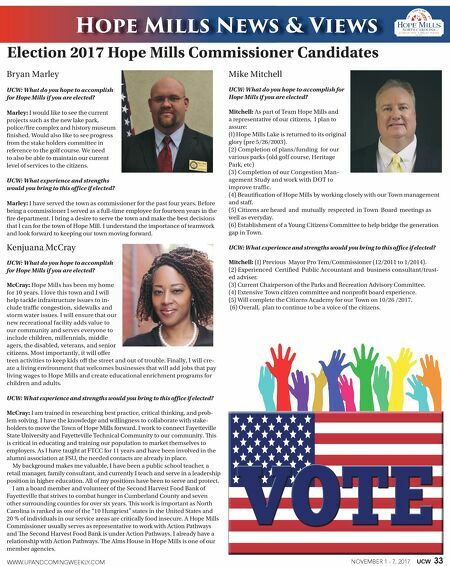 32 UCW NOVEMBER 1 - 7, 2017 WWW.UPANDCOMINGWEEKLY.COM Election 2017 Hope Mills Commissioner Candidates Hope Mills News & Views Bob Gorman UCW: What do you hope to accomplish for Hope Mills if you are elected? Gorman: ank you to our Hope Mills citizens for allowing me to be one of your town commissioners for 7 terms. I have worked honestly and tirelessly for our community throughout much growth and change; but, there are many existing projects that I would like to see completed as follows: *Historical Preservation Commis- sion which will preserve our Historic District and set guidelines for future development in that district. *Our Museum which has already collected artifacts and should be open in 2018. *Heritage Park which is in the third phase of our Lake Park Plan and will offer our citizens another recreational opportunity as well as education and remembrance of our community roots. You are aware, I am sure that Hope Mills has outgrown our present police and fire facilities. Our board has prioritized our infrastructure needs with the results of a facilities study. e top priority is a new public service facility for our police and fire departments. A plan for our former golf course is being developed with input from our citizens. is opportunity is to plan recreational facilities for our community and this a major priority for me. ere are areas that I believe are important and will work to see improve- ments: traffic congestion, transportation issues for our seniors, parks and recreation issues and veterans' issues. ese are important to our quality of life in Hope Mills. UCW: What experience and strengths would you bring to this office if elected? Gorman: Over the years, I have been involved in my community by being active in the Hope Mills Planning Board (4 years served as vice -chairman) I have been committed to community volunteer work : *Cumberland County Rescue Squad 12 years serving as Sergeant, Lieuten- ant Training Officer and Board of Directors (4 years) *South View Band Boosters for 25 years serving as president and president elect *Grays Creek Band Boosters for 3 years As an elected commissioner, I have served on various committees as a liai- son of the board, as Mayor Pro Temp, I have assumed the responsibilities for the Mayor if needed. As a member of the Finance Committee I have worked directly with the budgeting process. My experience in all areas of town govern- ment and a concern for our community and citizens is my priority #1. It would be an honor to serve our town for another term, I humbly ask for your vote. Meg Larson UCW: What do you hope to accomplish for Hope Mills if you are elected? Larson: If elected, I plan to work diligent- ly towards responsible growth and devel- opment, wise use of tax dollars to plan, budget, manage and complete projects and the development of an atmosphere of cooperation and trust between citizens, local businesses and government. Hope Mills is growing by leaps and bounds and we must ensure that our decisions are always in the best interest of the town. I want to work towards continuing to make Hope Mills a beautiful and enterprising community that will also at- tract people and businesses to relocate here. I plan to be accountable to the taxpayers when it comes to town spending. Taxpayers should expect wise use of their tax dollars and the completion of projects that are currently un- derway. Wasteful spending on consultants and unnecessary studies should be eliminated. I would like to work with the board to find ways to intention- ally encourage, not discourage, citizen input through cooperation, trust and transparency, especially when it involves the use of tax dollars and deci- sions that will shape the future of our community. UCW: What experience and strengths would you bring to this office if elected? Larson: If given the opportunity to represent the citizens of Hope Mills, I hope to bring new ideas, a fresh perspective, common sense and a lot of energy to the board. I hold a Bachelor Degree in Marketing and years of work experience in retail management and internal loss prevention. I also have experience working in education in Cumberland County Schools. I have been active in the community for years, regularly attend town board meetings and stay abreast of town issues through the town website. You can count on me to listen and thoroughly research issues in order to make logical, practical and fiscally responsible decisions that are right and fair. I am organized, self-motivated and a team player but I am also willing to stand alone and fight for what is right if necessary. I would greatly appreci- ate your vote for Hope Mills Commissioner. 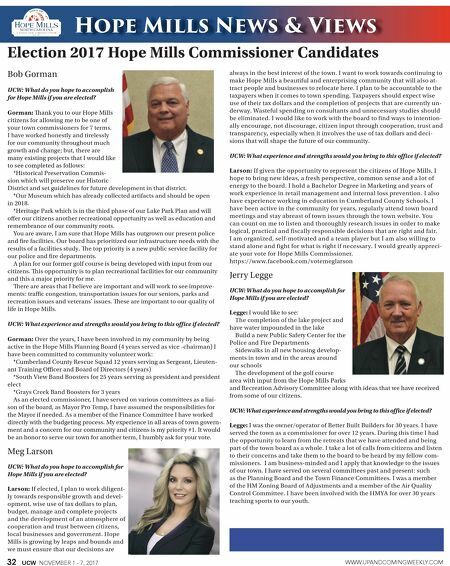 https://www.facebook.com/votemeglarson Jerry Legge UCW: What do you hope to accomplish for Hope Mills if you are elected? Legge: I would like to see: The completion of the lake project and have water impounded in the lake Build a new Public Safety Center for the Police and Fire Departments Sidewalks in all new housing develop- ments in town and in the areas around our schools The development of the golf course area with input from the Hope Mills Parks and Recreation Advisory Committee along with ideas that we have received from some of our citizens. UCW: What experience and strengths would you bring to this office if elected? Legge: I was the owner/operator of Better Built Builders for 30 years. I have served the town as a commissioner for over 12 years. During this time I had the opportunity to learn from the retreats that we have attended and being part of the town board as a whole. I take a lot of calls from citizens and listen to their concerns and take them to the board to be heard by my fellow com- missioners. I am business-minded and I apply that knowledge to the issues of our town. I have served on several committees past and present : such as the Planning Board and the Town Finance Committees. I was a member of the HM Zoning Board of Adjustments and a member of the Air Quality Control Committee. I have been involved with the HMYA for over 30 years teaching sports to our youth.